This salad is my own riff on a Scandinavian-style potato salad. It's practically a meal in a bowl; you can easily round out dinner with some lightly dressed greens and a hearty whole-grain bread. 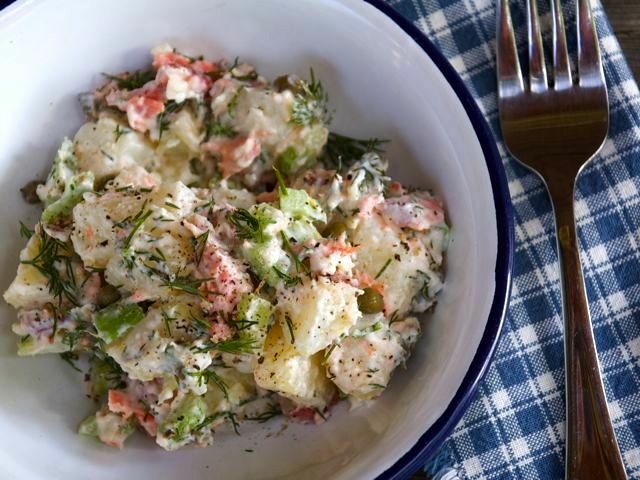 You could also leave out the smoked salmon and serve the potato salad alongside grilled or poached salmon, tossing any leftover fish into the remaining salad for another meal. Prepare the potatoes: Place the potatoes in a medium-large saucepan and cover with water. Add a big pinch of salt and bring to a boil, then reduce to a simmer and cook until tender, about 10 to 15 minutes. Drain the potatoes and set them aside to cool. Prepare the rest of the salad ingredients: While the potatoes are cooking, prep the rest of the salad ingredients (the onions, celery, dill, smoked salmon, and capers) and place them in a large bowl. Prepare the dressing: In a medium bowl, whisk together the lemon zest, lemon juice, sour cream, mayonnaise, mustard, and buttermilk. Stir in the chopped dill and season to taste with salt and black pepper. Assemble the salad: When the potatoes are cool enough to handle, cut them into large chunks, trimming off the skins if you like. Add the potatoes to the bowl of salad ingredients, top with the dressing, and toss lightly. Season to taste with salt and freshly ground pepper. Chill for several hours, then serve cold.